Our ERP & Technology Marketing Lists are all created through focused telephone and web based research supported by a Global database of over 1 million companies. All or lists are GDPR compliant in Europe. We assist our clients to understand, target and build relationships with key technology decision makers at all levels. Our clients are typically technology companies and their partners who are involved in selling into the ERP (i.e. SAP, Oracle, Microsoft, Infor, Sage etc.) and wider technology markets (i.e. BI, CRM, Finance, Supply Chain, BW, Storage, Networking etc.) and with over 150 technology fields to choose from we cover most mainstream technologies. All our lists are researched in full every 90 days and uniquely we offer a 45 day guarantee to replace any hard bounces or incorrect data identified through telephone marketing or other sales or marketing campaign activity. Our technology lists cover many Software and Hardware technologies Globally (please note some technologies will only be available in certain regions and countries so please see the table below for availability). Our lists cover Software Applications (i.e. ERP, FINANCE, CRM, HR, HCM, SCM, EAM, PRC, BW etc. ), Hardware Products (i.e. PCs, Notebooks, Servers, Mainframes etc. ), Networking, Storage, Operating Systems and Databases. 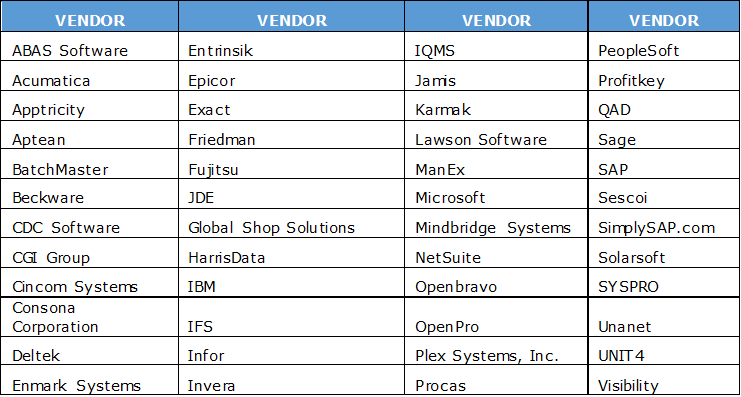 We have over 50 ERP Software applications to select from listed below. If you browse the list below to see if we have a relevant ERP software users list in your region then let us know your requirement and we get a count and cost for you. The following chart represents a summary of the ERP applications that we can provide across all the regions mentioned above with emphasis on North America and Europe. Global Software Leads also provides contact lists regardless of installed technology based upon the Job Title or Job Area/Function and Job Level (i.e. Seniority). All our lists are delivered with full Company details including Full Company Name, Address, Telephone, Fax, URL, Industry, Employees, Financials, Parent, Technology Installed and Contact details including Job Title, Email address and direct telephone where available.